I kept hearing rumors of an unusual visitor to Berry Hill over the last few months. 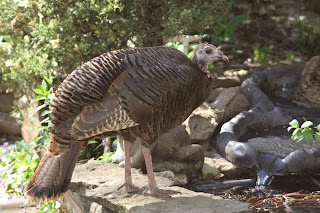 Yesterday, I finally witnessed her...our resident wild turkey was at the store most of the afternoon and seemed perfectly at home there. The other birds, squirrels and even the resident chipmunk all did double takes, though, along with every customer who came in while she was there. She is always by herself...very independent obviously. Loved the corn, peanuts and water provided. She is an inspiration to all the "single ladies" out there !! YOU GO GIRL !! 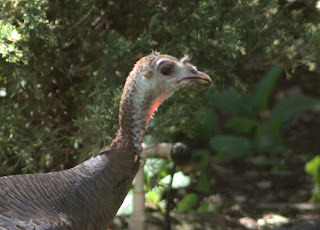 I have been constantly sceptical about the sightings of the Turkey at the store. Glad you were able to get some good photograpic proof. Thanks Rhonda! !